Shopping for the right running shoes can be very confusing. We often get asked by customers ‘what are the best running shoes?’. Well despite all running shoe brands telling you their brand of shoes are the best via clever marketing campaigns, there isn’t one brand and certainly not one shoe. Which Part of My Foot Touches The Floor First When I Run ? Due to modern life making most of us sit down all day the average person is very weak in their core. Which means when they run they sit back and land on their heels first. If you do this and you just want a pair of shoes to throw on and do a few miles rather than work on improving your posture then you need a shoe with some good heel cushioning (heel to forefoot 8mm or thick midsoled shoes like Hoka). If you naturally land more midfoot then a flatter shoe is better (4mm heel to forefoot or lower) have a look in our mid to forefoot category. How Much Cushioning Do I Need ? Getting the right level of cushioning is tricky. If the shoe is too soft then your foot doesn’t know it’s hit the floor so it doesn’t stabilise, cushion or offer any propulsion. This also means that your feet don’t get stronger the more you run which can lead to problems later. So, the cushioning should feel firm, but, not hard. To say heavier runners need more cushioning is partly true but, there is always the big guy who floats over the ground and the little lady who sounds like a herd of elephants. You’ll get an idea of which you are by how fast you wear out your shoes and how much noise your feet make as you run a long. How Much Room Should I Have In My Running Shoes ? Most runners are fine with a thumbs width of space between the end of their longest toe and the end of the shoes when they are stood up with the shoes fully laced up. You should be able to wriggle your toes freely. Your feet expand as they get warm so this space is to make sure that your feet still have enough room to function properly even when you have been running a long time on a hot day. Lots of foot issues are caused by not having room in your shoes and most people think they should have tighter fitting shoes than they should. You shouldn’t be lifting out of the shoe at the heel and a close fit around the midfoot is important but your toes should be free to function. In trail or fell shoes slightly less space in the end is usually fine as your feet don’t get quite the same pounding as they do on the road so they expand less. We’ve written a short and concise blog post on buying running shoes for wider feet. It contains a width guide for brand like Inov-8, Brooks, New Balance and a note on Altra’s FootShape Toe Box design. Buy running shoes for wider feet by browsing these specially selected shoes in the relevant width sizes. If you land on your heel first, as the foot hits the ground it may roll inwards (pronate). Whether this is a problem for you will depend on how much you role inwards. If you pronate your knee follows the foot and all the joints up your leg are slightly out of alignment, which can cause excess wear over a prolonged period of time. In the short term runners often get pain in their shins, knees, hips or lower back. If you get any of these and you are running in a shoe without support that isn’t worn out then some support in your shoes might help. 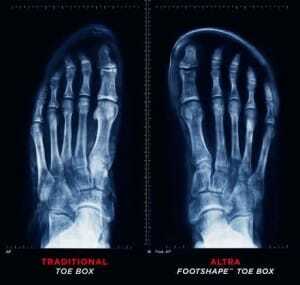 Too much support is equally unhelpful as your body will rely on the support and therefore your feet will get weaker. So, you need just enough support to stop any symptoms. So, as a rough guide if you get symptoms within a mile of running look in our structured cushioning category. If you don’t get symptoms until you have been running more regularly or increasing the distance then try the guidance category. Where Do You Run ? The surface you run on will obviously effect which shoes you pick. Unfortunately, despite the demand for a shoe that works everywhere, they do not exist yet! If you are on the pavement 99% of the time you buy road shoes for the cushioning and durability that are specially designed to cope with that unforgiving surface. 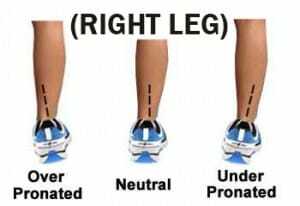 You should already have an idea of your foot strike type and the level of cushioning you may need from the points above and know which category to explore. If you run on often-rocky ‘mixed’ terrain trails then you’ll benefit from purchasing a trail shoe with a softer, more grippy outsole, a rock plate so you can’t feel the stones and a more durable upper. However, if you are lucky enough to run straight onto open fields through the mud and broken ground then look it’s important to prioritise grip by exploring the fell shoe category for some longer studded shoes and thinner midsoles that give more stability on broken ground.